After selecting the key pieces in our living space, I was excited to put the finishing touches on the room. 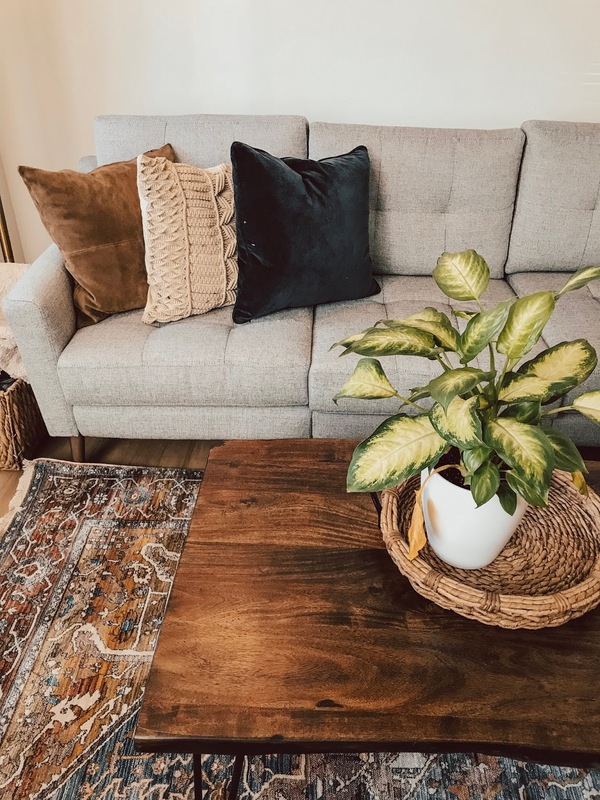 I needed to add the perfect throw pillows and blankets to really add warmth and texture and really tie everything together. 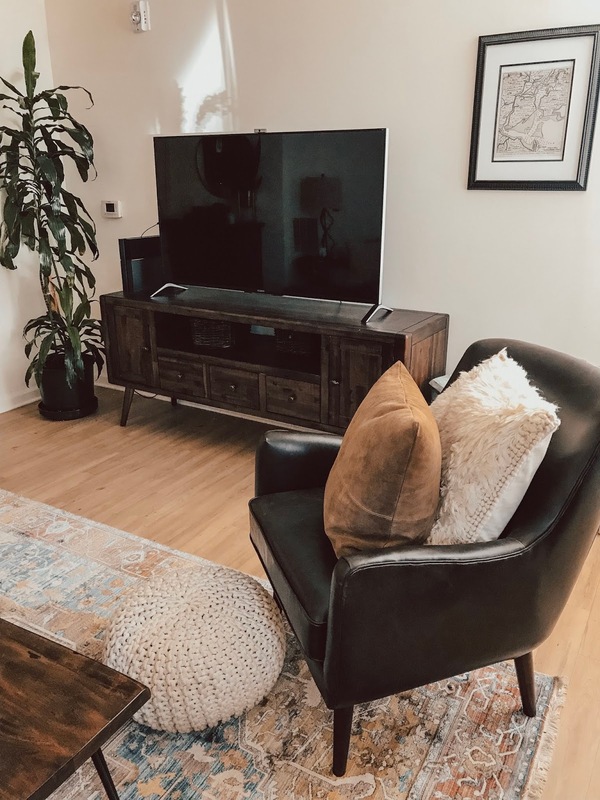 After working with The Company Store to redo our bedroom (Post here) I was blow away by the quality, comfort and of course style by their products, I knew with out hesitation, where to go when searching for pieces for our living room. The style we having going on in the living room is midcentury modern with a touch of rustic. 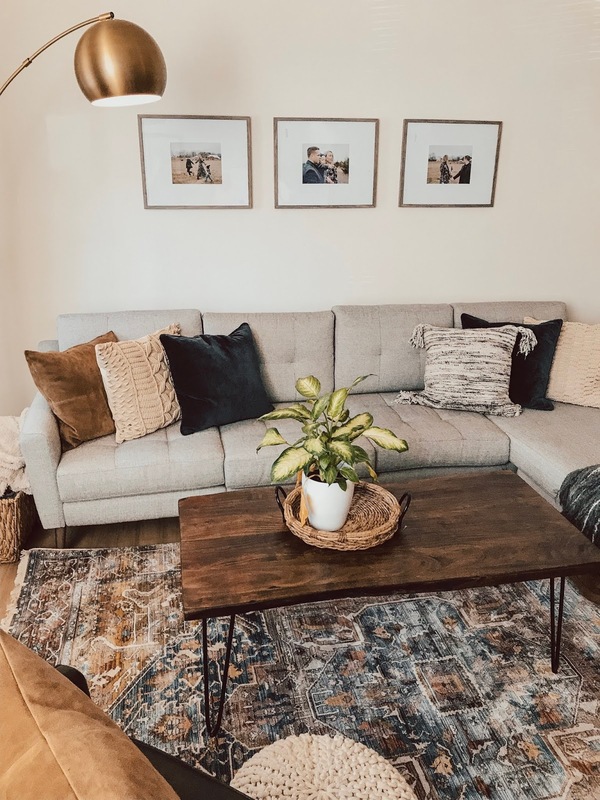 Our couch is a simple sleek light grey and the rug adds the warmth to the room. I wanted to pull colors from the rug for the pillows and throw blank. The company store has pages and pages of throw pillows, from different colors, patterns and textures. I first spotted the blue velvet pillow covers which I loved ! I think they add a nice warmth, velvet to me is so rich and luxe and the color, which is a dark navy Blue (color is called STORM BLUE) is so pretty and pulls from the rug nicely. This pillow cover comes in several color options as well as several size options, I went with two 20in covers. But the possibilities are endless! Next, I chose two suede pillow covers, in the color Rust! I LOVE these, these again add a lot of warmth and pull the rust color from the rug. I threw one on the couch and one on the brown leather accent chair. 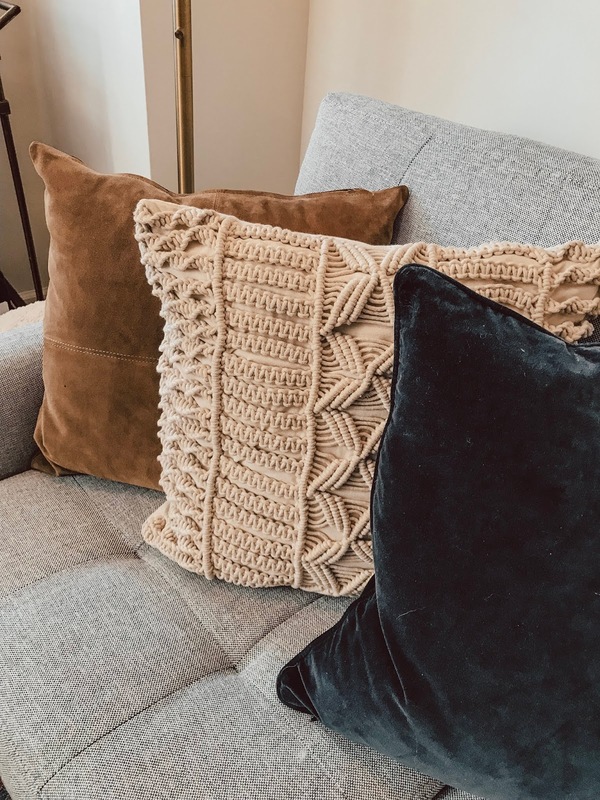 I wanted to add some texture to finish everything off so I added two macrame pillow covers that have two different weaves. I pulled one that is more simple (here) and one that has a pattern (here) I just think they are so pretty. If I ever decided to switch up the colors in the room, these can always just stay. Last I added a fun grey tasseled pillow which compliments the couch and pillows nicely . The room needed a cozy throw blanket to tie everything together. I loved the checkered pattern on this fringe alpaca throw and style wise it goes so nice with everything. Comfort wise, this blanket is the coziest and softest blanket ever. I am constantly wrapped in it while we watch movies! This throw would make for the perfect christmas gift for someone special in your family! (It's currently on sale!! ) . It took a few months to get finish this space, but I love the way it turned out! *thank you to The Company Store for sponsoring this post!